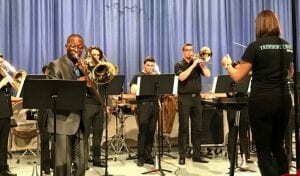 Dr. Martin McCain was a guest artist at the American Trombone Workshop in Washington D.C. 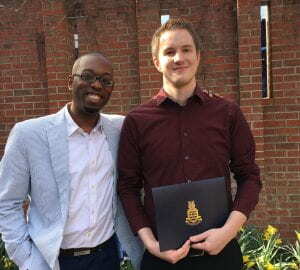 He presented a masterclass with his chamber ensemble, the Minor 4th Trombone Quartet, served on the jury for the National Bass Trombone Solo Competition and was a guest soloist with the University of Toronto’s Trombone Choir and the U.S. Army Concert Band “Pershing’s Own”. 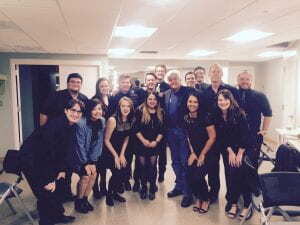 McCain performed with the IRIS Orchestra under the direction of Michael Stern and recorded a live broadcast with the ensemble on Memphis’ WKNO classical radio station. 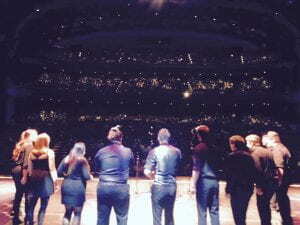 He also performed with the Memphis Symphony Orchestra under the direction of Robert Moody. Dr. McCain presented a masterclass to the trombone studio at the University of Memphis and a music business lecture entitled “Discover Yourself: Make Your Own Opportunities” at the University of Texas at Austin. 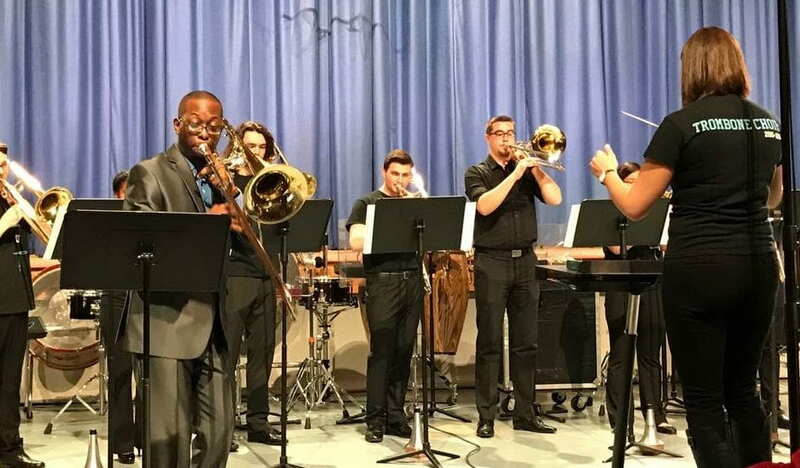 He hosted the Texas State Trombone Symposium, which included guest artists from the Atlanta Symphony, Buffalo Philharmonic and Zurich Opera. The Symposium’s international solo competition final round drew competitors from the Amsterdam Conservatory, Michigan State University, the University of North Texas, Oklahoma State University, Baylor University, the University of Southern Mississippi and Baylor University. Additionally, McCain’s second solo album “Shades” received a strong review in the recent quarterly journal of the International Trombone Association. This entry was posted in alumni students faculty NEWS on March 31, 2017 by Thomas S. Clark. 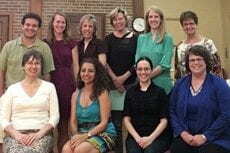 On March 26, Dr. Adah Toland Jones was an invited clinician for a group of teachers in the Houston Flute Club, part of a series the club has for its membership to discuss topics relevant to flute teachers at all levels. Topics chosen by Dr. Jones’ for her session included: “Taking Auditions,” “Common Flute Problems” (geared for band directors), “Vibrato” and “Double Tonguing”. These areas were animatedly discussed and the meeting provided all an opportunity to get to know one another and share common issues related to the flute teaching profession. This entry was posted in alumni students faculty NEWS and tagged Houston Flute Club on March 29, 2017 by Thomas S. Clark. Texas State music faculty Hank Hehmsoth, Russell Scanlon, Paul Deemer, and former faculty member John Mills performed for the national tour of “Beautiful: The Carol King Musical” at Bass Concert Hall Texas Performing Arts in Austin. This entry was posted in alumni students faculty NEWS on March 23, 2017 by Thomas S. Clark. 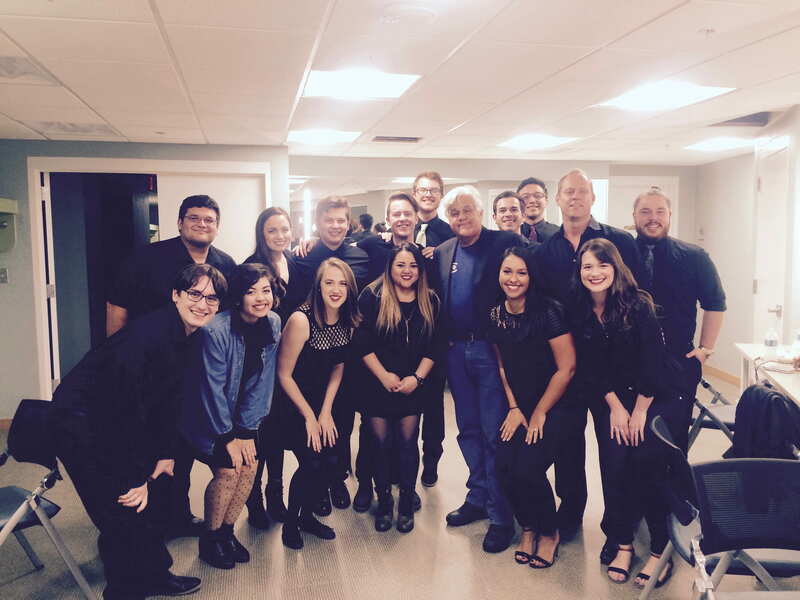 This entry was posted in alumni students faculty NEWS and tagged Jay Leno on March 21, 2017 by Thomas S. Clark. 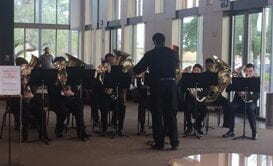 Raul I. Rodriguez presented a lecture and solo performance of 10 selections from his book of 30 studies for tuba, Low Blows for Tuba, on March 18 for the 2017 South Central Regional Tuba Euphonium Conference in Edinburg at the University of Texas-Rio Grande Valley . This entry was posted in alumni students faculty NEWS and tagged Low Blows, tuba etude on March 21, 2017 by Thomas S. Clark. 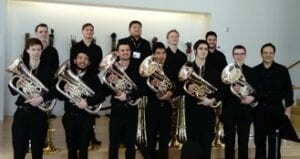 Eleven members of the Texas State Tuba Euphonium Ensemble traveled to south Texas during Spring Break to present a recital of contemporary literature on March 17 for the 2017 South Central Tuba Euphonium Regional Conference in Edinburg at the University of Texas-Rio Grande Valley. This entry was posted in alumni students faculty NEWS and tagged euphonium, tuba on March 21, 2017 by Thomas S. Clark. Second-year M.M. Performance student Michael Johnson has won the 3rd division of the National Bass Trombone Solo Competition at the American Trombone Workshop in Fort Myer, Virginia, home of the U.S. Army Band “Pershing’s Own”. This entry was posted in alumni students faculty NEWS and tagged American Trombone Workshop on March 9, 2017 by Thomas S. Clark. Master’s composition student Thomas Mann won the 2017 NACUSA Texas Composition Competition, Graduate Category, for Suite for Flute, performed by Texas State alumnus Lauren Lyman on February 18 at The University of Incarnate Word in San Antonio. This entry was posted in alumni students faculty NEWS and tagged NACUSA, solo flute on March 1, 2017 by Thomas S. Clark.